After several weeks of calm, three different consumer credit card offers changed in early November, resulting in a mixed bag of rate moves. The average rate for consumer non-rewards credit cards rose slightly, while the average rate for consumer rewards credit cards fell. 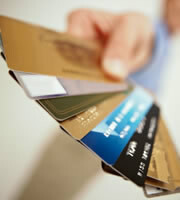 On balance, the average rate for the overall consumer credit card market fell. Student credit cards were also caught up in the climate of change, with an increase in the average rate for that category, leaving only business credit cards unchanged in the first two weeks of November. Under the circumstances, the flurry of changes was understandable, since credit card companies have had a fair amount of economic news to chew on recently. Looking at that news helps explain why those companies may have come to different conclusions about economic conditions, with some credit card rates rising while others fell. Signals lately have been somewhat contradictory, rather than signalling a decisive trend one way or another. For example, an argument for raising rates could be made by pointing at recent inflation numbers. According to the Bureau of Labor Statistics, inflation jumped by 0.6 percent in each of August and September, which if continued would project to an annual rate of inflation of more than 7 percent. While this recent surge was offset somewhat by a preceding period of very low inflation, credit card executives will be watching the November 15th release of October's inflation number with great interest, if not anxiety. In contrast, the most prominent economic theme immediately following the election was the fiscal cliff, which could be seen as an argument for lower interest rates. The fiscal cliff is a package of tax increases and spending cuts designed to reduce the deficit. Given the fragile state of the economic recovery, most experts agree that the severity of these austerity measures would drag the United States back into a recession. These measures are due to go into effect on January 1, 2013, and if the fiscal cliff is not avoided, it could lead to lower interest rates next year. This contradiction helps explain why credit card changes did not all follow the same direction. Some rates rose while others fell, underscoring the importance of actively shopping for credit card rates to get the best deal available. Consumer non-rewards rates rose by 4 basis points, to 15.19 percent, while rewards credit card rates fell by 19 basis points to 17.45 percent. The net result of these changes was to lower the overall rate for consumer credit cards. Having non-rewards rates rise while rewards rates fell narrowed the spread between these two categories to the lowest level in more than a year, increasing the relative attractiveness of rewards programs. The average rate for student credit cards rose by 7 basis points, representing the sixth increase for this category in the last five months. That makes this the most changeable category for credit card rates, and therefore one where active shopping and monitoring of rates is especially important. Business credit cards continue to have the most stable market for rates, with no changes since late July. As a result of the changes in consumer credit card rates, the spread between rates for customers with excellent credit and average rates widened to 3.95 percent. The widening of this spread increases the reward for maintaining a strong credit history. 0 Responses to "A shake-up in consumer credit card rates"